Proposition 126 is not a tax cut. It is not pro-business. It is not good for Arizona. Arizonans will have the choice Nov. 6 on whether to pass Prop 126, a ballot measure to amend the state constitution to permanently exempt the service industry from sales taxes. What may sound like a generous proposal to cut taxes is, in reality, an unfair handout to privilege some businesses over others. Prop 126 benefits the service industry while narrowing the tax base, making it more likely that, when push comes to shove, marginal income-tax rates will be raised on everyday Arizonans. Indeed, if the state ever needed to raise revenue, it would be cut off from a significant sector of the economy, forcing it to turn to raising much higher taxes on everyone else. After all, Prop 126 is not a tax cut. It is a roadblock to keeping tax rates low across the board. It would hamstring our state’s lawmakers, making it much more difficult for them to craft flexible, uniform and fair tax policy. What’s more, Prop 126 is not “pro-business” — it is pro-some businesses, and not others. There are several other ways Arizona could make it easier for businesses to thrive. Doling out special benefits to some while sticking others with the bill is unfair. It’s also bad policy. While Prop 126 would affect all 7 million-plus Arizonans, it would help only some. During a time when our state’s economy is dynamic and rapidly growing, we need a tax policy flexible enough to keep our taxes low and treat Arizonans fairly. We won’t get that with Prop 126. On Nov. 6, Arizonans should send this amendment packing. 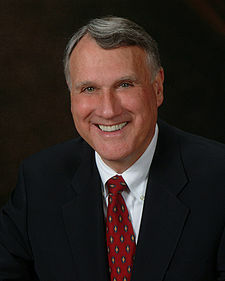 Former U.S. Sen. Jon Kyl is senior counsel at Covington and Burling in Washington, D.C.
Did you get your early ballot in the mail? When you do, vote YES on Prop 123, and put it right back in your mailbox. If you plan to vote on Election Day, make sure you mark your calendar for May 17! Prop 123 will put $3.5 billion into K-12 public schools over the next 10 years without raising your taxes. That’s money our kids and teachers need to succeed in the classroom. Today, the campaign released a new video with parents, grandparents and teachers urging you to vote YES on Prop 123. It’s a common-sense solution that better uses our state land trust for its intended purpose: funding our public schools. And it protects the trust, which will still grow by $1 billion over 10 years if Prop 123 passes. Can we count on you to vote YES on Prop 123? Proponents of Proposition 204 – the so-called Quality Education and Jobs Initiative – have hit the television airwaves with an ad that hides the measure’s wasteful spending and the special interests that back it. In fact, a large portion of the funds will never see the classroom, but will be redirected to other projects unrelated to education spending. With the usual appeal to helping the children, the ad hammers the point that the $1 billion a year permanent sales tax hike will put increased education funding out of the reach of state legislators. That is the fatal flaw in the measure. The peoples’ elected representatives will have nothing to say about how the money is spent. If you read the measure, there is no accountability or oversight on how they money is to be spent either. The legislature will be “exempted” from meaningfully guarding against wasteful spending. The direct appeal to voter emotions says that Proposition 204 will create a stable and permanent source of funding for K-12 classrooms. What it fails to say is that few of the dollars will actually reach the classroom and millions will go to programs that have nothing to do with education. Glaringly absent from the ad is any mention of the $100 million a year subsidy that will go directly to road building and public transit. Including the construction industry in the taxpayer-funded payout is a clever way to get contractors to help finance the pro 204 campaign. Also missing is any mention of funds sent to social service programs. Absent too is mention of the millions that will go to databases and monitoring that bypass the classroom. Arizona needs real education reform. 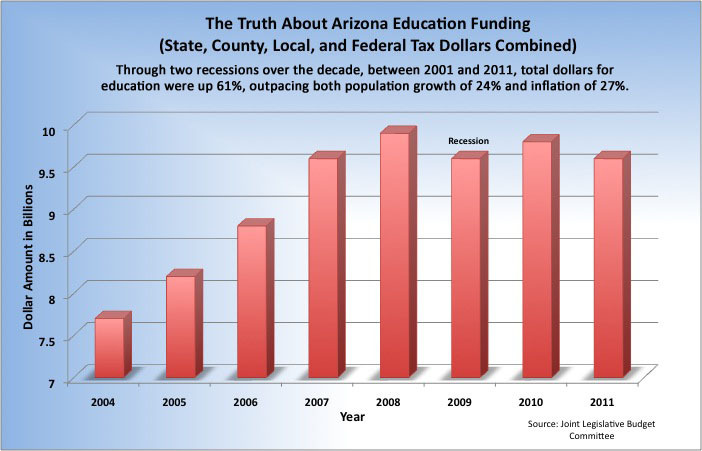 But Arizona has continued to invest in education, as Arizona’s education funding has increased over time. We have suffered two recessions since 2001 and consequently local and state tax revenue has changed. Arizona needs transformative education reform and not higher taxes for special interest groups. Proposition 204 is too taxing on Arizona families, please Vote No on Prop 204.